Today, December 18, the world celebrates International Migrants Day, an observance initiated by the General Assembly of United Nations to raise awareness of the large and increasing number of migrants in the world, and the unique issues they face. It is also an opportunity to recognize the contributions made by these millions of migrants to the economies of their host and home countries, and to promote respect for their basic human rights. To mark this year’s International Migrants Day, the International Organization for Migration (IOM) is calling on the international community to come together and remember the refugees and migrants who have lost their lives or have disappeared while trying to reach safe harbor after arduous journeys across seas and deserts. IOM, in collaboration with Esri, has created Migration Flows – Europe Story Map, to give a comprehensive view of migrants’ paths and their unique struggles. 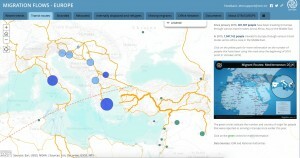 The Migration Flows Story Map shows such trends as which nationalities of migrant are most prevalent in which European country; the transit routes that different migrant communities take to arrive at their destinations; and the rates of stranded, relocated, displaced, and missing migrants. By seeing these trends visualized on maps, it is possible to better understand the issues facing migrants today, which are uniquely geographical.